This stylish greenhouse will provide a beautiful feature and addition to any gardener’s haven. It’s 9x6ft frame commands attention with 360 degree windows, allowing light and warmth to fill the interior and keeping all of your projects visible from the outside. 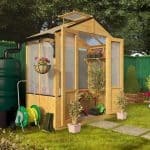 The Billyoh 4000 – If you are looking for affordability, style and quality then this greenhouse ticks all the boxes. Constructed using quality, hard wearing and long lasting wood this will stay the distance and look fantastic in any garden. The glazing is styrene and the roof has opening vents to allow good circulation. Your flowers and plants will flourish. Give your plants, flowers and herbs the light, warmth and space that they desire and you will see them grow and flourish before your eyes. 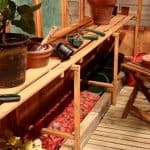 With enough space for a gardening enthusiast to house all of their favourite plants and some new ones too, there is also plenty of underneath storage for gardening equipment, soil bags and seeds. 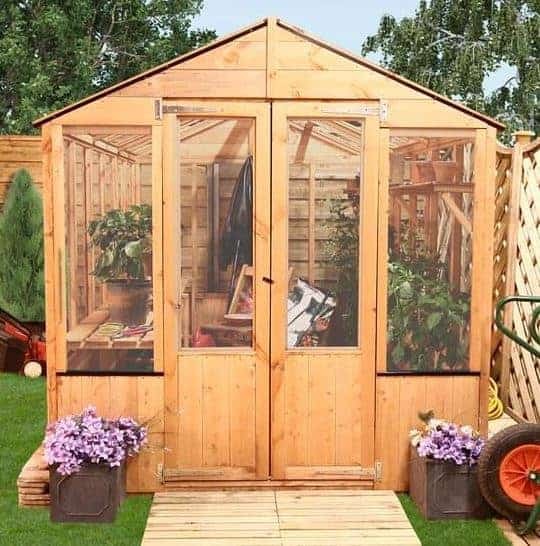 If you are seeking somewhere to store all of your gardening items in one place, giving them a separate home to the rest of your outdoor items then look no further than this fantastic greenhouse. Choosing the right greenhouse for your needs can be a difficult task, especially when there are so many models on the market offering various features and designs. 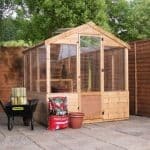 Below, the team at whatshed.co.uk identify and discuss any features of the greenhouse that may be of interest to a potential purchaser in order to aid in your decision making process. Exterior: The greenhouse exterior provides a strong and durable frame for the building, the unfinished wooden panels protect your items from the elements whatever the weather outside. Windows: The polycarbonate glazed windows and roof panels provide a 360 degree view in to and out of the greenhouse. The size of the windows allows for a huge amount of light and warmth inside and the airy feel is increased due to the large window vent. Doors: The large double doors allow for easy entry to and from your garden. 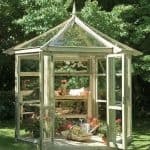 Great for pottering around in your greenhouse, when open, the doors allow for the fresh air as well as the sights and sounds of your garden to fill your greenhouse. Interior space: The 9x6ft interior space is a great size to allow for all of your gardening projects and storage for equipment and other accessories. With multiple options to have a variety of shelves and storage solutions as added extras in your package, you can design your greenhouse space to your exact requirements and layout. Whilst this model is primarily designed for use as a greenhouse, previous reviewers have stated that they have used theirs for different uses including a spacious garden room or sun room. Security: Whilst no security fittings are included in the package, it would certainly be easy enough to add a padlock, bolt lock or similar to the doors to make you building as secure as you require. 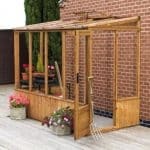 The Billyoh 4000 Lincoln Wooden Greenhouse: How easy to build? Billyoh provide full instructions with all of their products, including detailed descriptions and easy-to-follow diagrams, making it as easy as possible for those with little DIY experience to erect their building with ease. It is recommended that two people assemble this greenhouse due to the size of the panels, the 6ft height and the amount of glazing that needs inserting, however assembly could be achieved by an individual also. We expect that you could have this greenhouse assembled within a day. All fixtures, fittings, panels and glazing will be provided within your package. All that is required for assembly is a basic tool kit. 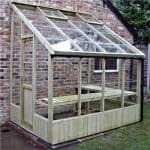 The Billyoh 4000 Lincoln Wooden Greenhouse: What is the overall quality like? With the Billyoh range you can rest assured that your greenhouse will be designed to help your flowers and plants flourish to the maximum. With every detail thought through carefully with the gardening enthusiast in mind, from durability to storage solutions, you can rest assured that this model will suit your every need. The strong and durable frame combined with the tough polycarbonate glazing ensures that your greenhouse will still be standing strong in your garden for many years to come. To maintain your greenhouse’s smart appearance simply keep clean by hosing down with water or by spot-cleaning with a sponge. 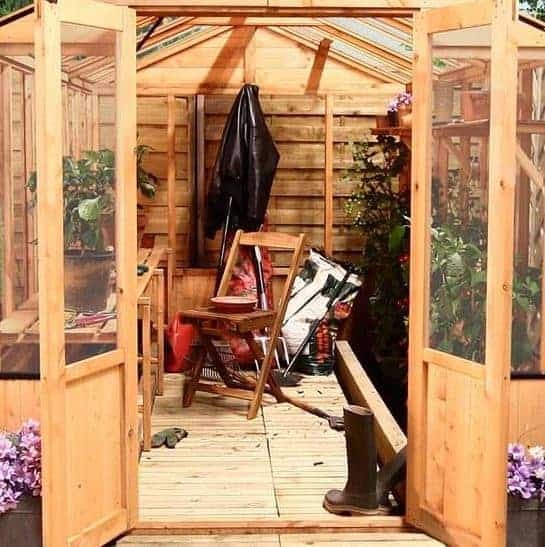 The unfinished nature of the wood offers the opportunity for you to paint and personalise your shed to suit the rest of your garden furniture and equipment. 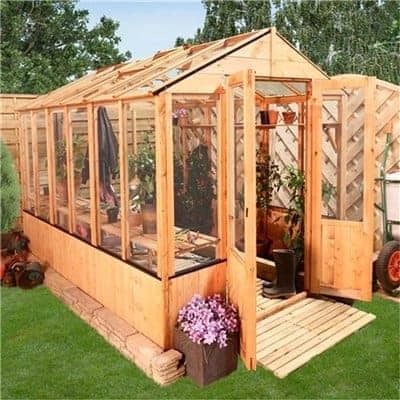 This wonderful greenhouse will make an attractive addition to any garden. The fantastic 9x6ft interior space will provide more than adequate space for all of your gardening projects and, depending on your preferences, as much or as little storage as you require. At a superb mid-range price, whether used as a greenhouse or a relaxing sun room you can enjoy the views out to your garden all year round. I’ve recently taken up gardening for therapeutic purposes, and I wished to move all my herbs into a greenhouse so they could get the proper light and warmth they deserve. I discovered the BillyOh 4000 Lincoln Wooden Greenhouse, and it has really helped my plants flourish. It’s just wonderful; easy to put together, sturdy, and lovely to look at. We’ve had a lot of rain in my area, and I was initially worried about how the greenhouse would fare, but it has stood the test remarkably well. My backyard looks beautiful with the pretty little greenhouse in the distance, and my herbs have become the envy of the local gardening club. If anyone’s looking to buy a good, cheap, and pretty greenhouse, I’d say this is the one. I have always wanted a sunroom as my television room. I noticed building an addition would be too pricey. I saw where people were connecting greenhouses to their homes and using them for the same purpose. I asked around was told this site had the best prices and the products were of great quality. I was skeptical at the low prices they were saying until I visited it. I saw this one and fell in love. The natural color of the wood was beautiful when it was delivered. The shipment came quicker than I thought it would. I purchased the 12×6 and it has more than enough room to lounge with guest or alone comfortably. It’s very strong and durable. It makes an excellent addition to my home. I have found myself spending most of my time in the room. It wasn’t a five minute job to set up, but it was quicker than I expected. The panels were also easy to handle and not bulky. It has double doors, which made it easy for me to move furniture inside. I was anxious for a couple days, but now that I’m using the product I’m very happy. I look forward to many laughs with friends and family in the new living are.